Hey there! I have decided to give away all 100 of my leap quests back to the community that I have played this game with for over 3 years. 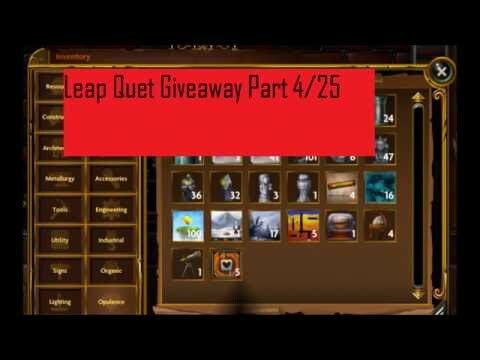 I will be giving away 4 leap quests per giveaway video! 1 of the competitions has already ended. I will be making 23 more of these over the rest of the month! The rules and giveaway is in the video below. I will tell you if you had won in a day or two after each video has been uploaded in order to give people time to comment. Go ahead and comment on the forums. But you won't be entered into the competition. Wow, 100 leap quests? Kudos to you, that's really, really generous! Yeah. I figured it was time to give a little something back. Btw, to everyone, I will keep this thread updated with the latest giveaway video so make sure to follow the thread and subscribe to my youtube channel so you can get a notification right away when the new giveaway vid comes out! @Retro_Chow I will be signing up on the video. And thank you for this giveaway. No. I just wan't an easy way to organize the competition. Please never be a psychic or a mind reader because your absolutely terrible at guessing what people want. An easy way would be commenting on the forums to enter also. You just want subscribers and views. You update this thread a lot so you can obviously check who enters. If you want to do a giveaway, it would be easier to do it here, where you told us about the giveaway. You just want subscribers and views. It is better to do it on youtube because I have a large deepworld fanbase on youtube. More people are likely to keep updated and see the progress of the competition especially if they are subscribers. More people=more people entering into the competition. It doesn't take a mathematics professor to figure that one out. Also, you put "You just want more subscribers and views." twice. Just like you assumed my heart's wants and desires, I'm going to assume that you are a complete idiot who has no sense of contributing anything helpful to this thread. People will find out about your giveaway on the forums and YouTube, so why not make it easy, like you said you wanted it to be, and let people sign up for the giveaway on both? People that visit this thread will be able to enter, and YouTube subscribers can enter also. More entries. It's common sense. There is nothing wrong with that. It seems like you just want views on YouTube. In my opinion a contest announced on the forums should at least let people enter on the forums, not just something else. My suggestion might bring in more entries. If you really want to give back to the community, you should consider letting people sign up on the forums. More people of the community will be able to enter. So far, you are refusing a simple idea, making it seem like this is about you getting views. I am hoping it isn't, and you really want to give to the community. Please show that I am right about this being about giving to the community, not getting views. I know you mean well but it would be much easier if you consider my suggestion. And please, do not insult me because I am offering my suggestion. Insulting people for offering a simple suggestion is not what this is for. Thank you. Ok first of all, Y U NO QUOTE. Second of all, if you are not gonna say anything nice to a person, except for "you want views and subs", then dont comment here.The guy is giving away 100 leap quests, and it would be nice of you could appreciate it. You didn't "suggest" anything. Your point was that I just wanted views and subs. The reason why I am not allowing entries to be submitted via forums is because it is a lot more difficult for me to keep track of who and who hasn't entered for each of the 25 parts of the contest. Youtube allows me to keep everything organized by allowing me to make 25 different videos. On the forums, I would have to make 25 different threads which I'm sure would be very annoying for forum-users who are not participating in the contest. Also, entries on the forum would be difficult to associate with the part of the competition they are entering for and they would also get lost in comments like these. I'm trying to make this simple for me and the people participating in this contest. Making entries eligible on the forums would confuse everyone and double my workload trying to get this competition to work. You know, that could be the idea, but why does it bother you ? The Look for Lisa competition is also only accessible via Facebook even though updates are posted in the forums. Go ahead and tell Lisa that's she is begging for likes in Facebook. Geez. It's just to promote his YouTube page and if you don't like it then you can just refrain from entering. Hey I entered the giveaway and if I win can I get the prize on weekends? School started for me so I have been super busy lately so yea.. Done! Can you add me, so we can PM? You have been told time after time after time after time by everyone to stop! Do you not listen? Stop commenting on old threads damnit! Agreed, now i'm wasting time making a YT account. Lol 4/25. I figured this would die off. And I never scored a leap.